Nuala Woulfe Beauty: Why does our Skin Age ? Why does our Skin Age ? Our skin ages as a result of sun, harsh weather, and bad habits. 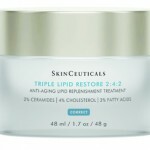 But we can take steps to help our skin stay supple and healthy-looking. Primary factors contributing to wrinkled, spotted skin include normal aging, exposure to the sun (photo ageing) and pollution, and loss of subcutaneous support (fatty tissue between your skin and muscle). Other factors that contribute to ageing of the skin include stress, gravity, daily facial movement, obesity, and even the position we sleep in, avoid sleeping on your tummy. • Skin develops lesions such as benign tumours. Solar keratosis. • Skin becomes slack. 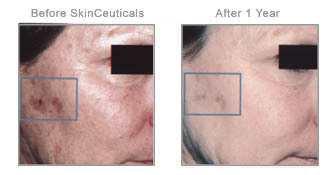 The loss of the elastic tissue (elastin) in the skin with age causes the skin to hang loosely. • Skin becomes more transparent. This is caused by thinning of the epidermis (the surface layer of the skin). • Skin becomes more fragile. This is caused by a flattening of the area where the epidermis and dermis (layer of skin under the epidermis) come together. • Skin becomes more easily bruised. This is due to thinner blood vessel walls. Changes below the skin also become evident as we age. • Loss of fat below the skin in the cheeks, temples, chin, nose, and eye area may result in loosening skin, sunken eyes, and a skeletal appearance. • Bone loss, mostly around the mouth and chin, may become evident after age 60 and cause puckering of the skin around the mouth. • Cartilage loss in the nose causes drooping of the nasal tip and accentuation of the bony structures in the nose. Exposure to sunlight is the single biggest culprit in skin ageing. Over time, the sun's ultraviolet (UV) light damages certain fibres in the skin called elastin. The breakdown of elastin fibres causes the skin to sag, stretch, and lose its ability to snap back after stretching. The skin also bruises and tears more easily and takes longer to heal. 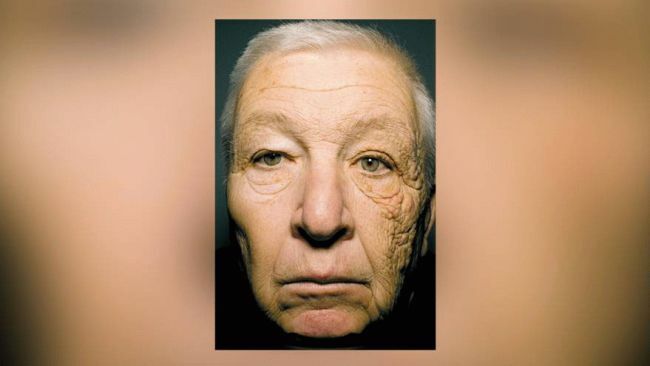 So while sun damage may not show when you're young, it will later in life. Nothing can completely undo sun damage, although the skin can sometimes repair itself. So, it's never too late to begin protecting yourself from sun exposure and skin cancer. You can delay changes associated with ageing by staying out of the sun, covering up, wearing a hat, and making a habit of using sunscreen. Gravity, facial movement, and sleep positions are the secondary factors that contribute to changes in the skin. When the skin loses its elasticity, gravity causes drooping of the eyebrows and eyelids, looseness and fullness under the cheeks and jaw (jowls and double chin), etc. Facial movement lines become more visible after the skin starts losing its elasticity (usually as people reach their 30’s and 40’s). Lines may appear horizontally on the forehead, vertically on the skin above the root of the nose, or as small curved lines on the temples, upper cheeks, and around the mouth. 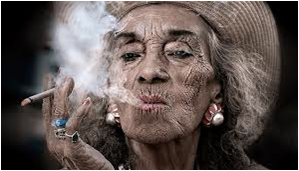 Smokers tend to have more wrinkles than non-smokers of the same age, complexion, and history of sun exposure. Dry skin and itching is common in later life. About 85% of older people develop dry skin because overheated indoor air is dry. The loss of oil glands as we age may also worsen dry skin. Anything that further dries the skin (such as overuse of soaps or hot baths and showers) will make the problem worse. Coconut oil as a body oil, Omega 3 Fish oils as an internal supplement will help to ease dry skin. Drink plenty fresh water.